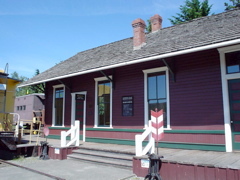 Issaquah Train Depot, the site for the train show. 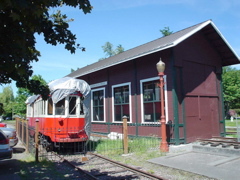 Located in Issaquah, WA, the depot has been restored and is open to the public Friday, Saturday, and Sunday from 11am to 3pm. 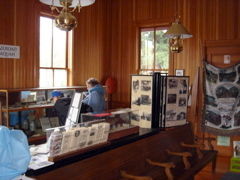 For up-to-date info, see http://www.issaquahhistory.org/depot/ or click on this photo. 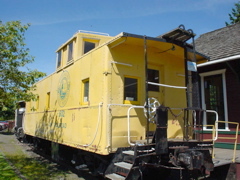 The caboose is empty (no displays). Next year we might put some BYOZ layouts inside. 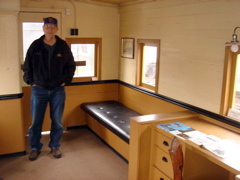 Jim Glass inside the caboose. 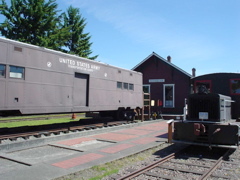 An Army car contains a HO model train of the Issaquah area. It runs with the push of the button...great for kids. Inside the Army car there is a layout...I bet we can get it running! Trolley and barn with a trolley inside being restored. 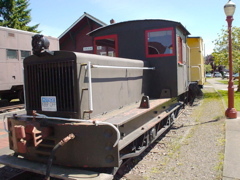 There is track behind the station. They have run trolleys up and down the track (about 1000 feet of track) in the past as an attraction. 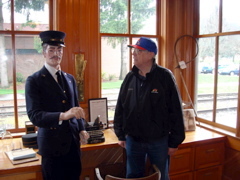 Jim Glass talks to the station master (who doesn't talk back). Very nice restoration, lots of nice people around. 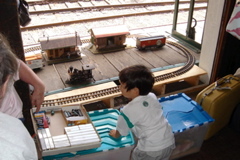 There are a couple of baggage carts on the track side that we put a G-Scale trains for kids. the baggage/freight room. 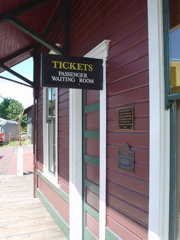 Inside the waiting room. 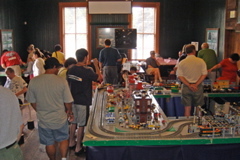 Our train show was in the baggage/freight room. 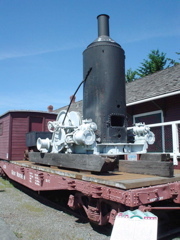 An old gas engine just waiting for a new power plant. 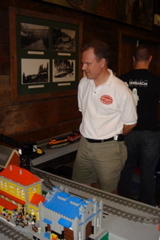 The Puget Sound Lego Train Club and our Northwest Pacific Z Scalers were the two primary clubs at the show. 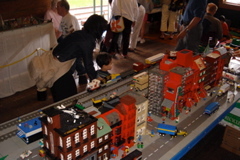 The Lego group had a large layout against the wall and two hands-on areas for the kids. 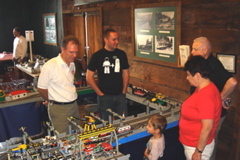 Dan Parker, Jeff Pelletier, and Brian Kelley explain that yes- Lego trains are toy trains, just like all the others. 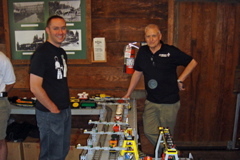 Andy Hunting (Zed Head) and Tony Hafner (Lego Lizard) discuss different opinions on glue! 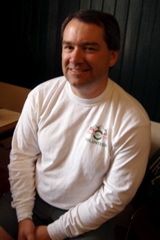 Dan Parker takes a moment for thoughtful reflection. 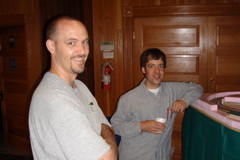 Jeff Pelletier and Brian Kelley take a short break. 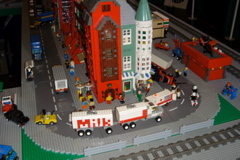 Lots of Lego buildings...the layout was just at the right height for kids. 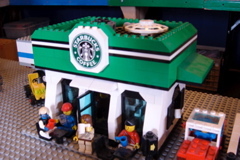 Milk being delivered for the Starbucks coffee. 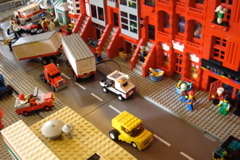 The LEGO folks had lots of interesting scenes with lights and action. Kids could get close to the action...sometimes, too close. 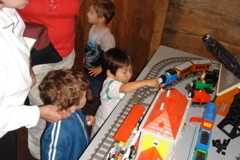 Hands-on area were a favorite with old and young. They could build a train, then put it on the track and run it! 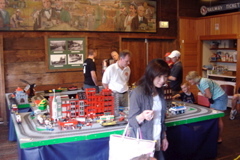 Lots of help getting Lego trains built and run...some parents had to drag kids away. 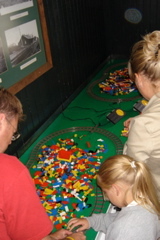 On the floor, tots could assemble trains. Tom brought one of his G scale layouts and put it on a baggage cart just outside the station. We opened the door and kids could watch the train going around. 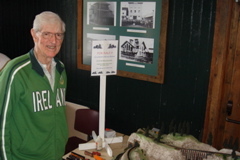 Tom Donegan brought a nice N scale layout he not longer needed and auctioned it off during the show. 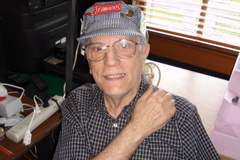 The proceeds went to the Depot's Trolley fund. 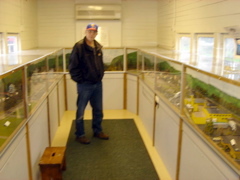 Jim Glass had plenty of visitors to his collection of Z scale layouts. 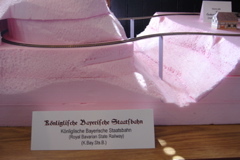 Todd Sargeant brought his Z scale layout in "pink" mode...should be a great layout.